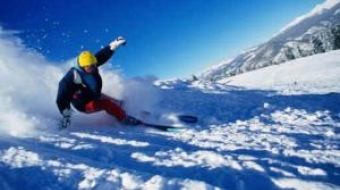 Looking to ski in B.C., but don't have the time for a four-hour drive? 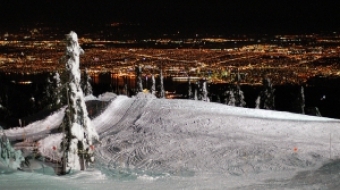 Look no further than Grouse Mountain in North Vancouver. Grouse Mountain looms over my family’s East Van condo. It’s the first thing we see when we leave the house in the morning and the last thing we see when we come home at night. If I squint hard enough at the white swath etched into its front, I like to imagine we can see people skiing and snowboarding down it. In 20 years of living together in Vancouver, my husband and I have never once gone there. My husband is from Morocco, and before coming to Canada had skied only once. I immigrated to Canada from California at age 11, and while I never skied with my family, I tagged along on skiing trips with friends a few times in my teenage years. It wasn’t until we had two energetic boys who required constant physical activity and fresh air that we felt the urgent need to visit the local mountains and to try skiing. Suddenly, we needed to be that iconic Vancouver family that skis in the morning and plays tennis in the afternoon. We announced our intention to ski Grouse Mountain to our ski-savvy friends and were promptly toured through their basement storage cupboards and attic crawl spaces to gather the necessary ski swag: waterproof pants and jackets, gloves and goggles. Our friends insisted that staying warm and dry as long as possible was the key to an enjoyable day at Grouse. On the morning of our planned ski trip, when I told my twin 10-year old sons they couldn’t play Wii because they had to get ready, there were some sour faces. But they soon became engrossed in playing dress up in all the new, exotic clothes. Despite the light rain, the parking lot was almost full. People were unloading ski equipment from their cars and groups of ski tourists were gathering to board the gondola. The gondola. I looked up and saw the giant box suspended from an overhead wire like some kind of immense lego structure, and then glanced over at my son who was afraid of heights. He was eyeing it with a mixture of horror and curiosity while staying glued to his dad’s side. We boarded the gondola cautiously and other passengers quickly flowed in behind us, filling up the spaces by the windows. As the tram lurched forward, I glanced out the window and breathed a sigh of relief; the windows were completely fogged up, obscuring any view. My afraid-of heights son would remain blissfully unaware that we were dangling by a thread off the side of a mountain high above the North Shore, Burrard Inlet and the City of Vancouver. I looked around at the other gondola passengers, There were three stylish young Iranian women wearing the hijab (veil), a family of French tourists, and a group of goateed young men who were swapping stories about the legendary skiing in B.C.’s interior where the snow was always dry and powdery. At the top of the mountain, we stepped out of the tram building and onto a solid base of snow, still crunchy despite the pervasive rain. We hiked over to the equipment rental chalet to get our skis.